Pong Dam Pioneer of conservation of waterfowls species, Come winters and most of the natural and man made lakes in the Himachal state become the bird-watchers' delight. The wetlands and the area surrounding the lakes including tall tress are now home to hundreds of species of birds including Bar headed geese, Common Coot, pintail, shovellar, common poachard, gulls and large Cormorant, Ruddy shelduck, Coots, Cormorants, Pochards, Mallards, Grebes and Moorhen for the next five to six months. 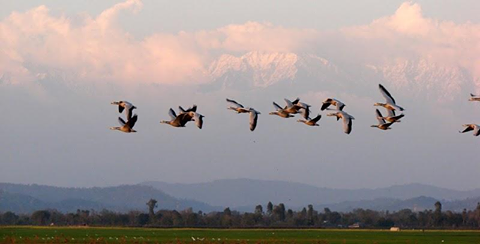 All the wetlands in the state are abode to migratory birds in winter but the Pong Dam wetland in Kangra Valley of Himachal Pradesh is the largest habitat of migratory birds in Himachal Pradesh.